Side Shell 3/4 & 5/8"
Flat deck cargo barge of all welded steel construction with raised forecastle and 6'4" breakwater. Shaped spoon bow, vertical sides, radiused bilge and square raked stern fitted with hydra-lift skegs. A centerline bulkhead combined with five transverse bulkheads divides the underbody into twelve watertight compartments. No. 1 and No. 4 compartments port and starboard are fitted with sea chests and are ballastable. The barges have a 6" wood wear deck and heavy tow pads on the bow. Flat deck cargo barge of all welded steel construction with a mold- ed spoon bow, perpendicular sides, radiused sheer and bilge and raked stern fitted with anti-yaw skegs. The fore and after rakes are divided into three compartments and a centerline bulkhead from frame 6 to frame 26 combined with five transverse bulkheads divides the underbody into fourteen watertight compartments. A breakwater mounted on the raised forecastle extends across the bow and heavy towing pads are mounted port and starboard. U.S. Marshal for 10% of bid at time of sale. Balance due three business days after sale. 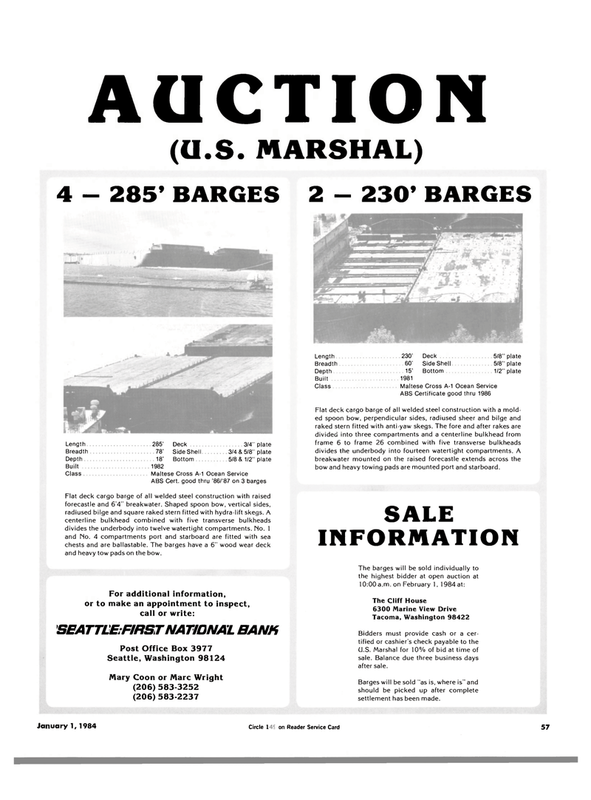 Barges will be sold "as is, where is" and should be picked up after complete settlement has been made.